With Easter on the horizon, we’re excited about bringing some of the cutest Easter decorations to grace your mobile home. Those who are on the fence about decorating for the holiday may be brought to the light. The sheer cuteness of these ideas is enough to get anyone off the Easter Scrooge bandwagon. 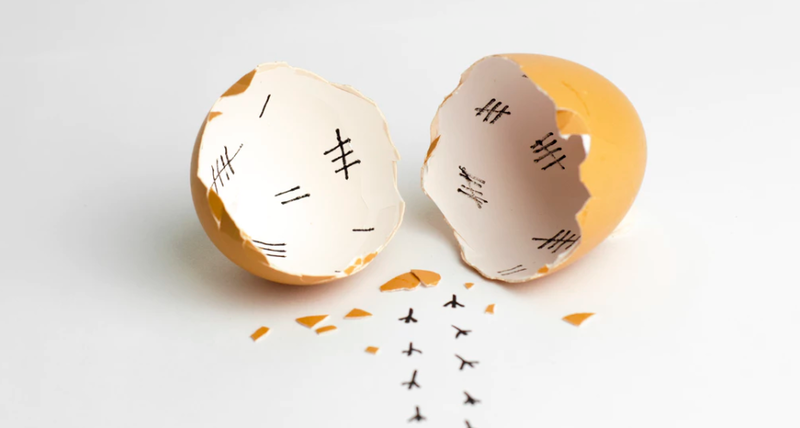 Easter is a celebration of newness in life. Pastel colors and glimmers of spring claim an integral part of the Easter aesthetic. There is a sense of fun that comes in weaving this theme of new life throughout the interior and exterior of your mobile home. We trust these ideas will fuel your creativity and a love for all things Easter. Whether it’s for your front door or living room, these Easter decorations are sure to elicit a smile. Read on and have fun. This bunny basket made out of an apple basket is sure to serve a dual purpose when Easter rolls around. If you’re feeling ambitious, you could even run with the idea and create a basket painted yellow and add eyes and an orange beak for a chick face. Acrylic paint and an ounce of creativity can go a long way. You can make your own Easter egg wreath with embroidery floss, glue mixed with flour, and balloons to shape the eggs. This idea will probably require more effort than the others we have listed here, but we think it’s well worth it. Be sure to select embroidery floss that fits the Easter color scheme you wish for. And don’t forget to plan ahead before Easter dinner so your wreath has time to dry in time for being shown off to company. 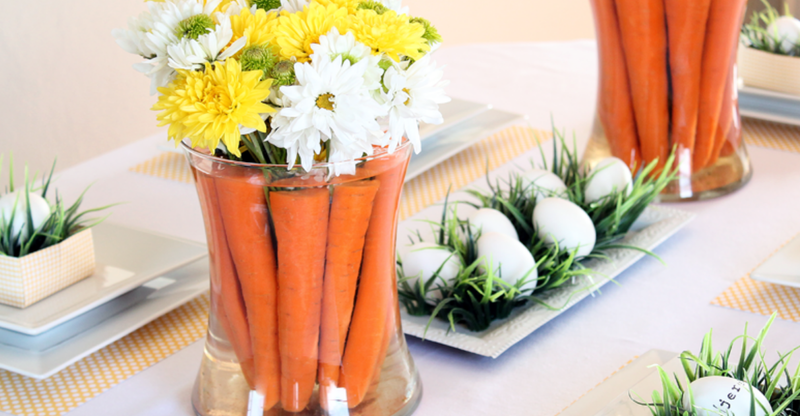 For an extra fun Easter flair, the carrot napkins and utensils are sure to enthrall the children at your dinner table. All you need are green utensils, orange napkins, and green pipe cleaners to tie it all together. Cute and easy for the win. 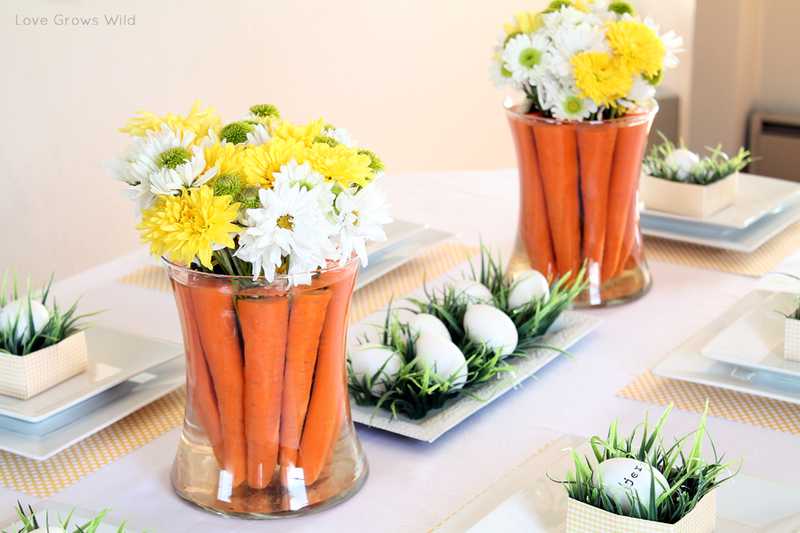 Now that we’re talking about carrots, let’s take a moment to point out this wonderful flower and carrot centerpiece. Cute, right? If subdued colors are more your thing, the grapevine bunny wreath may be what the doctor ordered. It’s sure to fit well with your current color scheme and receive many compliments from visitors. For your buffet or hall table, this framed Easter egg button craft can bring a simple but quaint touch of the Easter spirit. Talk about cute. Make sure that the buttons you use coincide with your chosen Easter decor palette. Pastel colors are in this time of year. For another fun do-it-yourself Easter decoration, check out these floating paper chicks. Baby chickens are often associated with Easter and springtime. Hang them up from the ceiling for some fun decor. Another dual-purpose craft, these Easter bunny mason jars can provide your family with a fun decorative gift. Fill them with candy, and give them away to your Easter dinner guests as a gift. Well, aren’t these clothespin bunnies cute? Here’s a fun decoration project children will enjoy. These bunnies are made out of wooden clothespins, paint, markers, and twine. It’s an easy, low budget bit of decorative fun. 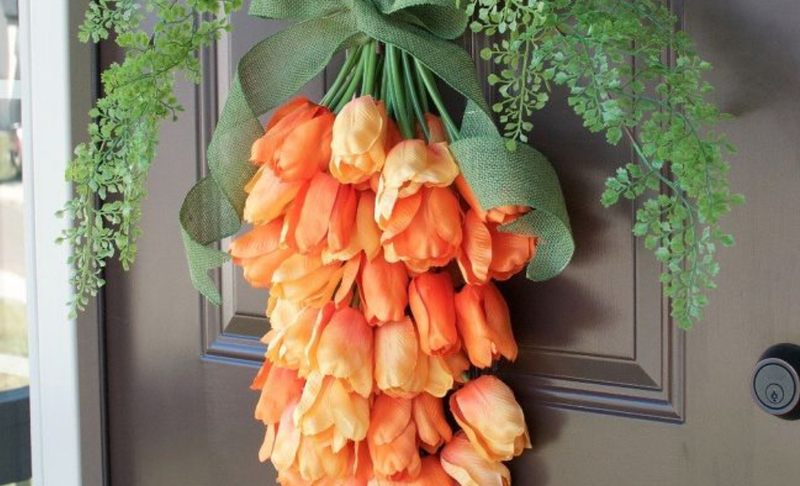 This carrot shaped door wreath brings a nice touch of spring and Easter to any door. A carrot made of faux tulips is a perfect springy combination. An Easter bunny banner can be whipped up as a family project — no sewing required for this banner! So we’d say it’s a cute win all around! Another cute decoration you can store for reuse next Easter! As you can see, many of these cute Easter decorations can be pulled together on a dime. You don’t have to go out and spend bucks to bring a splash of Easter and springy fun into your home decor. In some cases, you’ll find the materials are in your garage storage or in your craft bin. Take some time to sift through your store’s dollar bins. You never know what you’ll find! Happy decorating and a very happy Easter to you and yours! For more Easter fun, check out our guide to planning and organizing an Easter egg hunt for your park residents. This is a great way to build community while having a bit of fun. Get your neighbors involved and have some fun. The team behind the scenes at EZ Homes. Bringing you fresh ideas about mobile home lifestyle and design.